I have been working on a project lately which help in the detection myogenic potentials (of the levels of micro-volts). After studying from several places, I finalized the following test circuit. Can anyone suggest how can I go ahead since such small voltages are already very difficult to measure. Thanks in advance. Although it is possible to design a Sallen Key filter with a gain higher than unity, this is rather uncommon for a reason. Any gain in it introduces positive feedback into the structure and leads it towards instability. Particularly when you take the amplifiers own poles into consideration. The OPA177 has a gain bandwidth of ~600kHz, at a gain of 3 you have an unaccounted for pole at ~200kHz in your Salen-Key stage, pretty close to the frequency of oscillation that you are observing. Reduce the gain in that stage to at most 1.5 and recalculate your filter elements. You can start by removing R8 (thus setting the gain to unity) and test what you get. 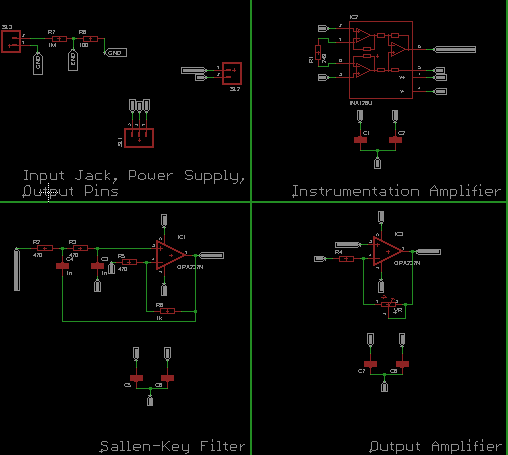 The opamp in a Sallen-Key filter is supposed to be a unity-gain buffer. Yours has a gain of +3, so it isn't surprising that it's oscillating. Wikipedia talks about this. If you need that much gain, you need to do it elsewhere. There's also the Application report from Texas Instruments Analysis of the Sallen Key Filter that explains why the gain of 3 or more will an issue. To be specific, Pg. No 5. The fact that your circuit is oscillating at such a high frequency suggests very strongly that you have ground/decoupling issues. JRE commented that you need a solid ground plane, and I agree. Admittedly, this means you'll need to get creative about routing -Vcc. Additionally, your schematics do not include the decoupling caps which have clearly used. Please update to show what you have actually used. Another risk is SHARED VDD rails. As a kid, I built (did not say "designed", but built) numerous 6-stage discrete-bipolar AC-coupled amplifiers that OSCILLATED UNTIL I learned to use a TREE-filtering mindset for the rails. The OPA177 has excellent PSRR at DC, but at 100Hz is about 80dB, and at 1MHz will be only ZERO DB (1:1). Thus VDD trash at 1MHz will referred-to-input not be attenuated. Yet your 100X gain stage has no bandwidth restriction. And the opamp-filter stage will have no control over its output at high frequencies, and VDD trash will come right thru). One additional design task is the VDD Tree (actually two VDD trees). Suppose you have 60Hz at 1 ampere (377 amps/second), 1 meter away from your PCB. 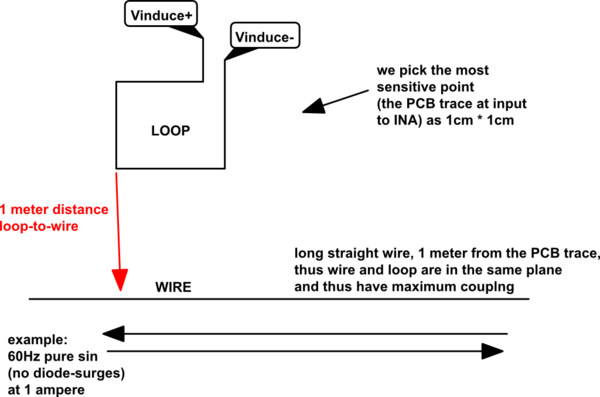 Assume your PCB as 1 cm^2 loop at the input. How much interference will you pick up? If the distance is closer, you get more trash. If the PCB area, or the differential-wiring area, is greater, you get more trash. If the 60Hz has current surges from rectifier diodes (usually near the sin wave peaks), you get more trash. If the current is from a black brick switch-reg, the dI/dT easily is 1,000X faster, and you get more trash. What are the degrees-of-freedom, to reduce Vinduce and/or reduce risks? have input-surge-filtering on all 60Hz power supplies, so the rectifier diode surges are not 10amps/10 microseconds but more like 10 amps / 1 millisecond. now about those skin-sensor conductive pads and the wiring: enormously vulnerable to magnetic fields and to electric fields---- its a tough world. Notice the computed level is 8 nV @ 60 Hz. For a setup that has the HOT power wire at infinite distance from the RETURN power wire. Normal power cords have the HOT next to (2mm apart) the RETURN wire, thus expect another 10:1 or 100:1 reduction. This is why high-end-audiophiles use special power cords, when their power-amplifiers draw 100 amp peaks, with ugly fast diode-turnon current-surges. Not the answer you're looking for? Browse other questions tagged instrumentation-amplifier biopotential medical sallen-key or ask your own question. 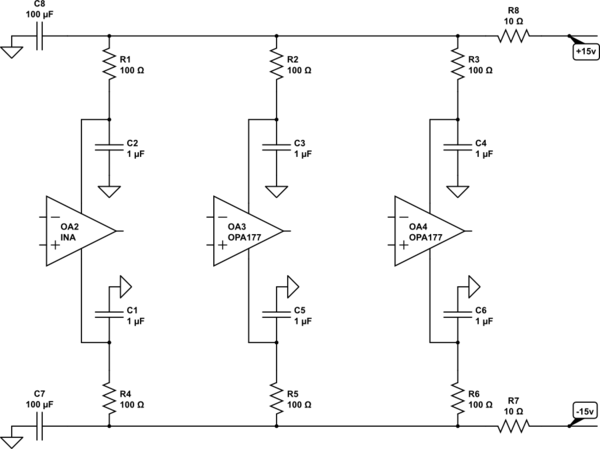 To what extent does an ADC solve noise along an analog circuit? Can Texas Instrument's INA332 really be used for EEG? Can ECG electrodes be used for EEG detection?